Posted November 21, 2018 by Mitch Hitch & filed under Inner West Independent. The future of Callan Park is back on the political map and is set to become a state election issue. 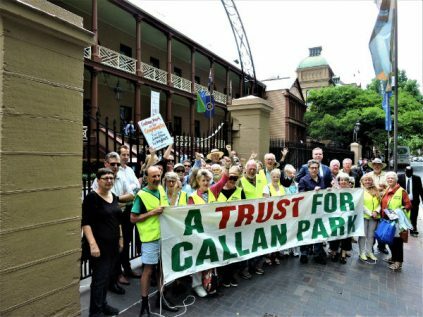 Friends of Callan Park successfully lobbied MPs on Tuesday as the first step in a campaign to persuade the state government and state opposition to take immediate action. They held a short rally outside Parliament House addressed by the Member for Balmain, Jamie Parker, and then sent delegations inside to visit various politicians. ‘We have a window of opportunity between now and the state election in March next year to make some real progress on Callan Park,’ Mr Parker told the local residents. The situation at Callan Park is at breaking point. Iconic sandstone buildings on this heritage site from the 1840s and 1880 are being demolished by neglect. These buildings are on both the State and National Heritage Registers, yet successive state governments have been evading their responsibility to protect and preserve these extraordinary assets for at least three decades. Other less significant buildings are boarded up and also falling into ruin. The Office of Environment & Heritage commissioned a Landscape Structure Plan earlier this year to demolish some of these 1960s buildings and open up the foreshore and enhance the parkland. Funding has been refused despite the estimate for implementing the plan being just $6 million. The government has also refused to establish a Trust to manage Callan Park. Every other major public park in Sydney has a Trust to manage it. The Friends delegation which met Gabrielle Upton, the Minister for the Environment with responsibility for Callan Park, met a brick wall in respect to funding and establishment of a Trust. By contrast, Labor’s Deputy Leader and Shadow Environment Minister, Penny Sharpe, and Elly Howse, Labor’s candidate for Balmain, reiterated Labor’s pledge to establish a Trust for Callan Park if they win government. However, Labor would make no financial commitment to the site beyond saying they would consider it in the process of making the 2019 state budget. Gladys Berejiklian told Jamie Parker the same thing. The trouble with such delayed promises that the budget is not due until two months after the elections, so the issue can easily be shelved. A plan to re-introduce step-up, step-down facilities at Callan Park for people suffering from mental illness is also being delayed despite a promise from NSW Health in June. But the state government can afford to fund the investment in Callan Park right now. It is flush with cash. The NSW state budget surplus for financial year 2017-18 was a cool $4.2 billion. The money needed for Callan Park is a miniscule pinch of that. Besides, this same government has $1.8 billion to spend on stadiums. The money is there if they wanted to do the right thing by Callan Park. Realistically, the big block for this government is the Liberal hostility to public assets. Since its election in 2011 it has been on a privatisation binge – it has realised more than $62 billion in the selling off of everything from social housing, the major ports, the electricity grid and generators, to the Land Titles office and so on. But as a state election approaches, a bulging treasury, low indebtedness and road projects galore may not be enough to win it for the Liberals, according to John Sidoti, the Liberal MP for Drummoyne, the electorate next door to Callan Park. This politician, like many of his constituents, knows Callan Park well because he uses the Bay Run. He told a Friends of Callan Park delegation that the government needed to demonstrate ‘heart and soul’ if it wanted to guarantee victory at the next elections. In his view Callan Park was the place to do just that, by investing in the park and locating some community mental health facilities there. ‘That’s what I will be telling Gladys,’ he assured the Friends who met him at Macquarie Street. Friends intend to continue pressing the state government for investment in Callan Park right up to the elections if need be. So far, the Premier and Treasurer have refused to meet the Friends who are now considering confronting them at public functions. Callan Park and its future are too important for the Inner West community to be just fobbed off. Hall Greenland is president of Friends of Callan Park. The next meeting of the Friends is Monday December 3 at 6.30pm at the NSW Writers Centre in Callan Park – all are welcome.